Those born under the Chinese zodiac signs of the rat and the rabbit have a fair chance of making it work, but not without some determination on both parts. The Chinese rabbit has a soft, pleasant nature might not be easily recognized by the rat, who tends to be more outgoing, bold and lively. However, individuals born under these Chinese zodiac signs are also very likely to be affectionate and dedicated. The rat’s nature of being somewhat possessive yet encouraging are traits the rabbit could benefit from. The rabbit will enjoy the rat’s lively and seductive behavior and provide the rat with their own kind of care. The Rat and Rabbit in love can be a bit strange. At first sight, it would seem they aren’t a great match for each other, yet a lot of their differences complement each other nicely and their love compatibility can go up greatly. There are qualities of each that go great with each other and make a fantastic love pairing, but there are some issues too that if left unchecked could grow into resentment. With attention and some compromise, these two animal signs could be just fine. The Rabbit man or Rabbit woman could learn a thing or two from the rat’s carefree attitude and positive outlook since the rabbit sometimes thinks very negatively. While the rat continues to trust and value the rabbit, the rabbit will be well taken care of by the rat. The rat is social and lively and can even be a little devious. The Chinese rabbit animal sign is more calm and may not enjoy being as social as the rat. However, they both do enjoy being around family and friends and make sound, rational goals for their lives. They both tend to be very smart with money. The Rat and Rabbit compatibility will need to attitudes of acceptance and diligent work to be successful together. The rabbit’s tranquility and tact is something the rat should value. The rat should also refrain from chastising the rabbit, as the rabbit doesn’t appreciate the attitude and could decide the relationship isn’t worth it. In turn, the rabbit can help by realizing the rat is overly ambitious when doing projects and this will burden the rat, causing them to feel overwhelmed. If the rabbit can slow the rat man down long enough to take a breath and schedule their tasks in an efficient manner, the rat can cope with their anxiety and be a better zodiac match for the rabbit. According to Chinese astrology compatibility, these two animal signs are going to run into trouble when an argument arises. The arguments will tend to be lopsided in the rat’s favor and when they are settled it will almost inevitably end with the rat getting their way. This happens too for the Rat and Rabbit in bed. The rat woman has a clever mind and is fairly eloquent, which makes their statements sound better than the rabbit’s, who tends to be shy and easily swayed. They would rather give in to whoever they are arguing with rather than stand up for themselves, as they don’t like friction. However, over time if the rabbit male or rabbit female begins to resent not being heard, that resentment could be placed more on the rat and not on the situation and lead to discontent. Ultimately, the Rat and Rabbit friendship is better than being lovers. The rabbit is devoted, which is something the rat values highly. In a friendship, there will be less emotional investments than if they are in a romantic or sexual relationship. With arguments likely ending in the rat’s favor most times and the rabbit being shy and a bit of a pushover, a friendship will take less toll on the two over time than a romance might. And this might mean a Rat Rabbit relationship break up, predicts the Chinese horoscope match results. However, this isn’t to say they can’t make it work. For the Rat Rabbit compatibility, a happy relationship is possible. They may just have to work a little harder than others. Be it the Rat female or Rat male, the Rabbit can keep their partner grounded. 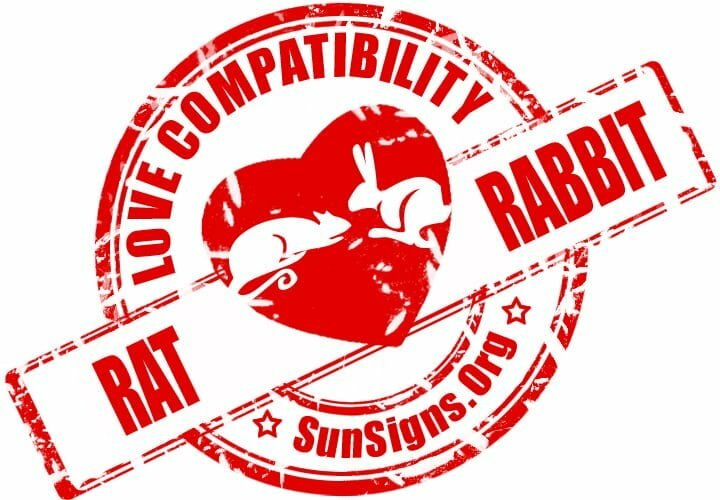 Rat & Rabbit Chinese Horoscope Compatibility Rated 4 Hearts!